Acropolis Aviation chief pilot Philip Lintott-Clarke, Airbus Corporate Jets president Benoit Defforge and Acropolis Aviation CEO Jonathan Bousfield (from left to right) celebrate the first delivery of the ACJ320neo. Airbus has formally brought its ACJ neo (new engine option) series to market with the delivery of the first ACJ320neo to UK-based Acropolis Aviation, the manufacturer announced today. The bizliner is headed to AMAC’s facility in Basel, Switzerland, to be fitted with a VVIP cabin designed by Alberto Pinto. The aircraft also will sport Acropolis Aviation colors. 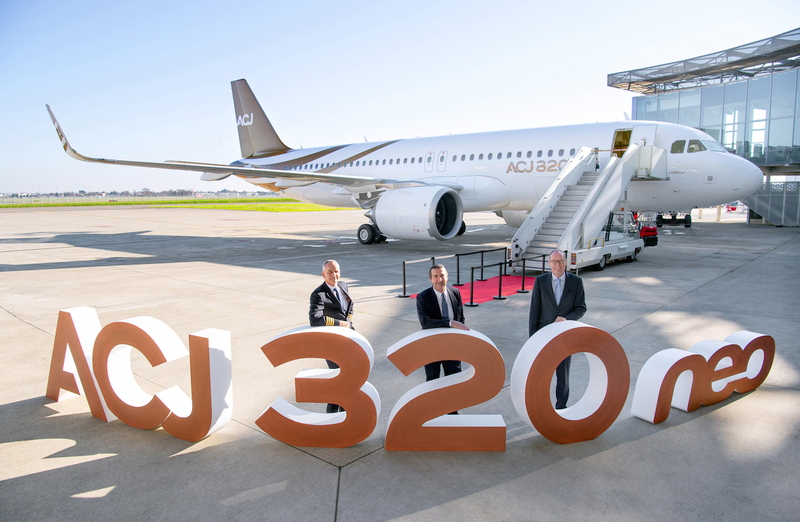 “Delivery of the first ACJ320neo is the latest milestone in the roll-out of a completely new ACJ family, enabling even more of the comfort, range, and value prized by business jet customers,” said ACJ president Benoit Defforge. Airbus launched the neo family in 2010, offering re-engined versions of the original A320 family with Sharklet winglets and either Pratt & Whitney PW1000G or CFM Leap-1A engines. The result is a 15 percent improvement in fuel burn. The initial Airbus 320neo received joint FAA/EASA certification in late 2015 and Airbus has delivered more than 600. Airbus flew the first of the ACJ320neos in November, leading up to the delivery to Acropolis. The bizliner variant of the 320neo is designed to fly 25 passengers 6,000 nm, giving it the ability to connect London to Beijing or Moscow to Los Angeles. In addition, the aircraft are designed with features such as a 15 percent-improved cabin altitude, higher mtow and cruise altitude, and airstairs. Its sibling, the ACJ319neo, can fly eight passengers 6,750 nm. Airbus last month announced certification of the Leap-powered 319neo, with Pratt & Whitney testing coming this year. The planemaker anticipates delivery of the first ACJ319neo in the coming months. By late last year, Airbus had nine orders in hand for the ACJ neo family—six for the ACJ320neo and three for the ACJ319neo.